The insurance company often wants to settle your case as soon as possible – and for as little money as possible. You need time to determine just how serious your injury is, what medical treatment or physical therapy you need, and how much your lost wages will be. Don’t talk to the insurance company. Therefore, it is crucial to retain a qualified personal injury attorney as soon as possible to achieve maximum compensation. Negotiate a settlement that takes into account all future medical and financial needs or litigate the case through a trial and a verdict if the defendant or insurance company do not offer enough money for us to recommend settlement. These accidents may involve drunk driving, hit and run, uninsured or underinsured drivers, as well as collisions and rollovers of SUV and semi-tractor trailers. If you or a passenger in your vehicle suffers injuries in a motor vehicle accident, the White Plains, New York law firm of Zelenetsky & Associates, P.C. has the experience and dedication to obtain the maximum possible compensation for your injuries. We will obtain compensation for your pain and suffering, lost earnings, loss of enjoyment of life, and property damage. Generally, drivers must exercise "reasonable care under the circumstances." A failure to use reasonable care is considered negligence. A person who negligently operates a motor vehicle may be required to pay for personal injuries or property damage suffered by another driver or passenger. The injured party, known as the plaintiff, is required to prove that the defendant was negligent, and that negligence was a “substantial factor” in bringing about the plaintiff's injuries. If you have been involved in a motor vehicle accident, we have the experience and knowledge to maximize recovery for your injuries. The law firm of Zelenetsky & Associates, P.C. also represents those injured in White Plains, Westchester County and all of New York in all types of motor vehicle accidents, which can be caused by: defective products or design of automobiles and trucks, including defective seatbelts, brakes, tires, or gas tanks; reckless driving, including speeding or the failure to comply with the basic rules of the road; improper roadway design or maintenance, including potholes, inadequately marked roads, or poorly supervised roadway construction; or drivers under the influence of alcohol or drugs. 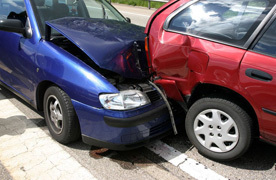 Injuries that result from these types of accidents can be life altering and severe. Accident victims often suffer burns to their head and neck, receive nerve damage or spinal cord paralysis, break or dislocate bones, or even lose the use of an arm or leg. At Zelenetsky & Associates, P.C., we understand that in addition to recovering the maximum amount for pain and suffering, accident victims also require the maximum compensation possible for their lost wages to prevent any financial suffering, future expenses for medical treatment, and their immediate medical bills, particularly for those injured by the uninsured or who have insufficient health insurance. We provide dedicated, aggressive, and comprehensive representation to make sure accident victims receive all possible compensation. Insurance companies are not in business to give the maximum settlement—their goal is to pay victims as little as possible. If you are injured in a motor vehicle accident, before you sign or settle anything with an insurance company, please contact our law firm.